The Menno Simons Centre is a not-for-profit student residence in the Point Grey neighbourhood of Vancouver, near the University of British Columbia. It is an off-campus residence, and our student residents attend a wide range of post-secondary institutions in the area. 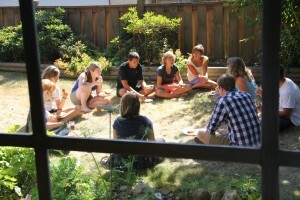 The Centre was opened in 1986 when the Pacific Centre for Discipleship Association recognized a need for a Christian residence where students could grow in their faith while attending university. The Centre is not just a place to live. It’s an intentional community of people seeking to integrate their faith and learning and exploring what it means to live in Christian community. There are 24 single rooms at the Centre. Each room contains a bed, closet, and desk. Many also have a sink. As an act of service to the community and the facility, all students are required to contribute to weekly cleaning tasks. There are two fully-furnished kitchens for students to do their own cooking, as well as shared bathrooms. A large dining room, study lounge, small chapel, recreation/TV lounge, laundry, and bike storage room are available for resident use. A guest room is available for overnight visitors of current residents. A bus stop is located just a block away, and it’s only a ten minute ride to UBC. Students can also bike there in 15 minutes. More detailed information is available in our application. Apply here.